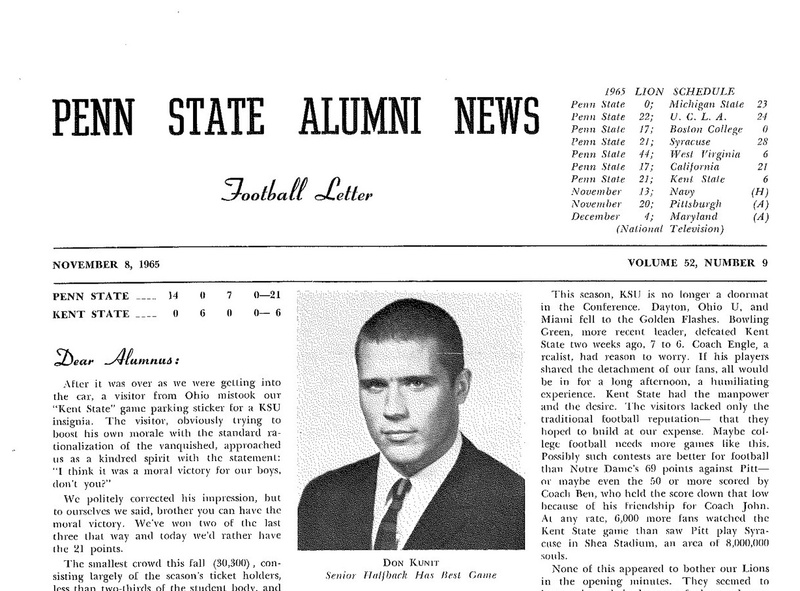 That quote came from a Kent State publicist prior to the school’s first football meeting with Penn State in 1965. As Ridge Riley ’32 wrote in The Football Letter the week after the Lions’ 21-6 win, a Pittsburgh newspaper reporter asked the publicist if the Golden Flashes’ upcoming game against the Nittany Lions would be their “game of the year.” The publicist replied that it was a little bigger than that. In the midst of a roller coaster season that would end with a 5-5 record, the Lions lost at Cal on Halloween weekend before bouncing back a week later for a home win over Kent State. Senior halfback Don Kunit ’66 (above) carried 11 times for 76 yards, part of a Penn State rushing attack that totaled nearly 300 yards on the day. It was a rough year all around for the Lions, who struggled to a 3-9 mark. Among those losses was an eight-point, mid-September loss at Nebraska. A week later, the Golden Flashes once again provided a reprieve. Alan Zemaitis ’11 had a 26-yard interception return and knocked down four other passes in the Penn State victory. A week removed from a 24-3 humbling at Alabama, the Lions returned to their home field for another well-timed meeting with the Flashes. Derek Moye ’11, who caught his first NFL touchdown for the Steelers on Monday night, hauled in four passes for 87 yards in the win. Kent State is back in Beaver Stadium this weekend. The Lions are coming off a frustrating loss to Central Florida. This entry was posted in From the Archives and tagged Alan Zemaitis, Beaver Stadium, Central Florida, Derek Moye, Don Kunit, Kent State, Ridge Riley. Bookmark the permalink.